Fantastic service from Cable Chick. I know of no other company, that can beat their posting service along with great prices. 128GB SanDisk Ultra Micro SDXC Memory Card with SD Adapter (Class 10 UHS-1) + FREE SHIPPING! SanDisk Extreme Pro 128MG Micro SD Card + SD Adapter - Expand. Enhance. Upgrade. 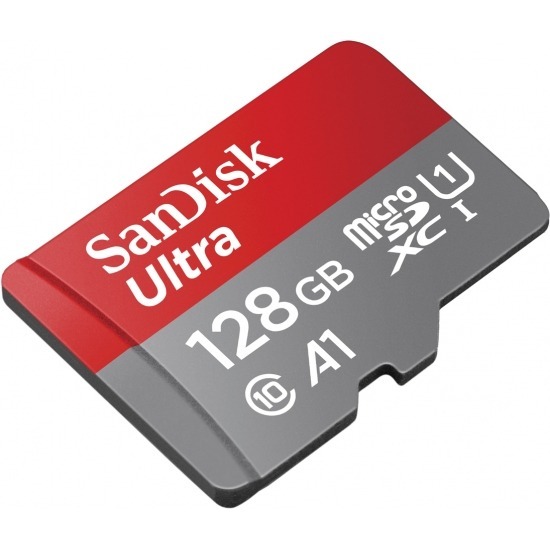 Provides an incredible 128GB of memory in one tiny card for all Micro SD (SDXC) compatible devices, and SD Card (SDXC) devices via included adapter. Please note that SDXC cards are not compatible with most devices released prior to mid 2012. Supports up to 100Mb/Second speed. Just about everything seems to take MicroSD cards these days. From your Android Smartphone to your digital camera to your fancy new wristwatch, we all crave more space for more stuff whether its movies to watch, music to enjoy or games to play. This High-Capacity Micro SD card (SDXC) offers 128GB* of storage, so ensure your device can handle momory cards greater then 32GB (in the SDXC standard). Most devices less than a few years old should however. It's a Class 10, UHS-1 speed rated card, making it one of the best and most versatile bang-for-buck options on the market - perfect for video capture in camcorders or GoPro cameras! You also get an SD card adapter, so if you have a USB card reader that doesn't support MicroSD, or you would like the option to use this in your big DSLR, you're covered out of the box. For easy USB access without any fuss, our Compact USB Card Reader is a great optional accessory. * Formatted capacity less. Full UHS-1 performance requires a UHS-1 enabled host device. Did you know Cable Chick also stock USB Power Banks? There are no Frequently Asked Questions for this product. In Stock Ships FREE by 4PM Today! Only 2 left in stock!!! Leaves warehouse by 4PM Today! I'd like to thank your company on it's customer service. I recieved my order the very next day after sending it in. Very quick and efficient. The cable was easy to install and now because of it I get 5.1 ch surround while watching movies on TV. Did you know Cable Chick also stock iPad Accessories?